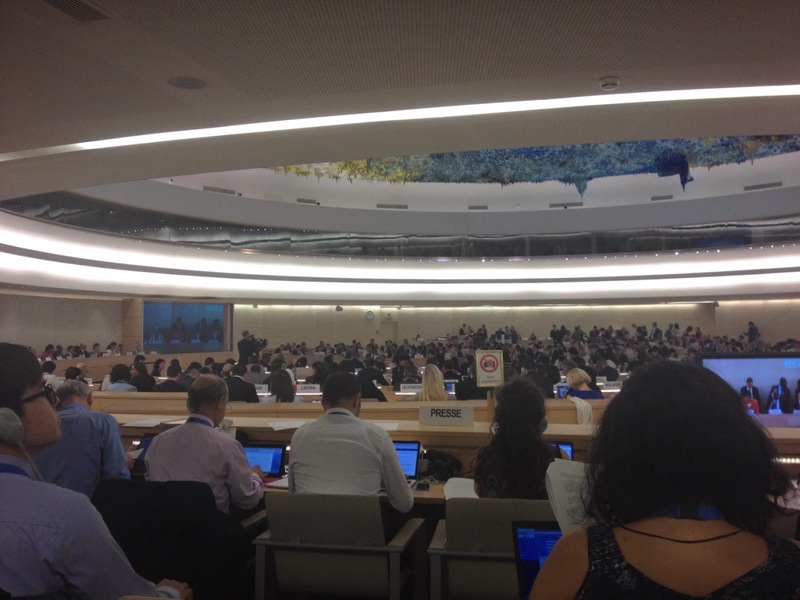 The 26th session of the Human Rights Council began on June 10, 2014 at the Palais des Nations in Geneva. The United Nations High Commissioner for Human Rights, Navi Pillay, opened the Council with her opening statement that described the achievements of the Office since the previous Human Rights Council (March 3-28, 2014) and was followed by a General Debate with the Member States. In her opening statement, Navi Pillay referred to the Universal Periodic Review as an impartial and non-selective process which has succeeded “in encouraging States to recognize and resolve gaps in human rights protection” through constructive dialogue with civil society and international organisms. She emphasized the dignity of all human beings and that all, without discrimination, are holders of human rights. On the other hand, the persistence of war crimes, political and civil conflicts, such as in Syria, Israel and Palestine, and Thailand, and also many human rights violations around the world mean that the new Post-2015 Development Agenda must take into consideration human rights and international accountability. The main issues during the first week of the Council were rights to freedom of expression and peaceful assembly and association, violence against women, extreme poverty, and the independence of judges and lawyers. Experts, States, civil society, and other stakeholders participated and voiced their opinions about these issues under Item 3 of the Human Rights Council: Promotion and protection of all human rights: civil, political, economic, social and cultural rights, including the right to development. Since equality is the basis of human rights, it is necessary that all States commit to the protection against discrimination and promotion of all human rights. Impunity, transparency, and accountability are the main issues that States must address. Particularly critical issues are increased security of journalists and human rights defenders, violence against women, especially in light of recent circumstances of terrorism with the kidnap of over 200 girls in Nigeria, and working migrants.